As humans, we tend to think of time in years; as measurable portions of our own lives. Though we know that the ‘grand landscape’ is a ‘work in progress’ that has been formed by millennia of continuous exposure to wind, water and the other forces of nature, we nonetheless tend to consider it as static. I suppose that is a fair, even utilitarian, way of thinking; one that I am just as ‘guilty’ of as the next person. After all, we are unlikely to see any obvious changes to the appearance of the Grand Canyon in our lifetime. Nonetheless, perhaps once or twice in a lifetime are we are able to see a sudden and significant change in what we had considered in our thoughts to be immutable. Such was recently the case for me. On the same trip to Michigan’s Upper Peninsula on which I took the picture discussed in yesterday’s blog entry, I also had the chance to photograph Miner’s Castle. 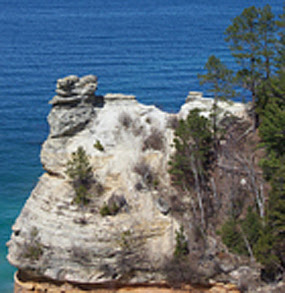 This distinctive rock formation is very easy to get to and is one of the more famous of the many that can be found along the Lake Superior shore. At the time that I happened to be there, the light was not particularly amenable to taking dramatic images. Like the rest of the tourists that dropped by that day, I clicked off a snapshot or two while enjoying the view. The image below is not much more than a documentary type photograph of the location (see below for an explanation of the black circle). It is not a site that I had expected to change very much. But it did change. 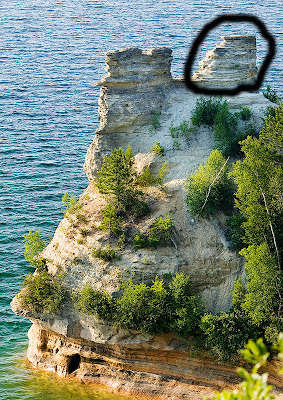 Shortly after I had been there, one of the rock turrets collapsed into Lake Superior. The formation will never look the same. Though I have not been back since the collapse, I was able to find a more current image. The image below is from the National Park Service, and was taken after the collapse. On my photograph, I have circled the area that is now lost forever. This is not an overly dramatic change in the rock formation, as the main structure still stands, but it is one that means something if you have ever been there. And it is enough to illustrate that nothing ever stays the same forever.